Marathon weekend has now come and gone. Boy was it an event. It started off with a Saturday wake up call to a very sick Charlie. I was scheduled to run the 5k at 10 am. Needless to say that didn’t happen. I was starting to worry that he would not be well enough for me to leave him on Sunday morning to run the half. It’s so interesting because a week ago, I was wondering if I even still wanted to do it. Then at the thought of not being able to go got me all worked up. Of course my first priority is Charlie. But I realized Saturday morning that I actually wanted to run this race. I hadn’t felt like that much at all during this whole process. It was a very strange feeling. Saturday night I actually went to bed early and slept well all night. I set my alarm for 5 am but ended up waking up around 4:30. Not seeing much reason to go back to sleep I decided I would just get up. I went down to check on Charlie and he was actually doing well. He gave me the green light to go ahead and make the journey. So I set off to pick up Lisa and head to Nags Head. Once we got to the Dream Center…where the event begins…I wasn’t extremely nervous. I had a few butterflies but was so in awe of the number of people around. Hugs, well wishes and laughs going on all around you has a much needed positive effect on the nerves. The plan was to run with Lisa for a few miles and then just get in our own groove and do our thing. Run our own race, as Matt put it. We heard the gun go off for the first corral. That’s a fitting term for it as we were literally corralled like livestock to the front as each group was given the green light to start their race. It got to be our turn to start and from the beginning my legs didn’t feel quite right. This isn’t unusual as I am a slow “starter-upper” when it comes to running. I find it takes about 2.5 miles to get into my groove. My legs felt like lead. We started off very slowly. 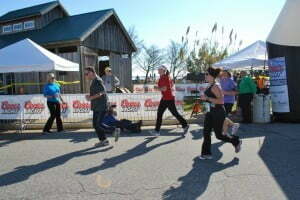 Lisa and I kept pace for about the first mile. Even though my legs never did warm up, around mile 2 things got just a tad easier. I was looking forward to mile 6 as I knew once there it would be easier. 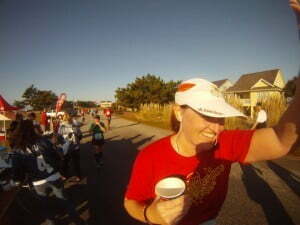 What I found at mile 6 was the Brindley Beach water booth, the “easier” part I was hoping for never did show up. That Brindley booth was a needed sight as many of them are also Bootcampers. The cheering and encouragement was much appreciated at that point. I knew I was nearly halfway. However, my hips said, halfway? You’ve got to be kidding, we’re done! By then most everything else is blurry until Mile 11. I do remember a brief holler from the Beach Realty water table at Mile 9 or 10. Then the bridge! Oh the bridge. By this time I was fighting the pain with everything in me. Fighting the hip pain so much that my shoulder muscles got so tense it almost replaced the pain in my hip. Shaking out my arms, shrugging my shoulders, I boldly took on the bridge. Within a few steps I knew it. I knew I needed to walk it. My feet were numb, shoulders screaming, hip burning, I just needed the small break. At the top of the bridge, no excuses, it’s all downhill I have to run it. So I did. Hit the next water station, got up about a half mile and who finds me? Thing 2! Re caught up with me and just as I was about to take off on another jog, she said she needed to walk a bit. I was certainly not going to argue with her! So we made the pact to walk for mile 11 and pick up the jog at 12 all the way in. It’s been suggested many times by Adam that throughout our training we take part in an ICE BATH. I’ve never been brave enough to try it. At mile 11.5, I was begging for one! This is how I knew what trouble I would be in, if I finished this thing. Re kept assuring me we would finish, even if we were crawling! I believed her, knowing she would drag me behind her if she had to! That’s what “Things” do for each other! 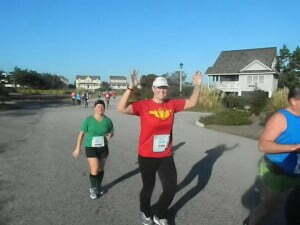 About mile 11.75, I start proclaiming with every ounce of determination I had that I would NEVER, EVER, EVER do this again! Why in the world did I agree to do this? People who do this are just plain crazy. I’ve done one and I’m not doing another. Of course at this point I’m not even finished yet…Oh dear! So mile 12 is upon us. We take off in a jog. Re says she has to stop again. I knew darn well she wouldn’t for good! I’m jogging away in all the pain thinking to myself, less than a mile…you just have to go less than a mile. A little ways down I knew I had to be half a mile out. I kept saying, just a half a mile, you can do it, half a mile. Then to the corner off the main road onto the side roads a lady yells out “Only a quarter mile to go!” Oh dear God, I’m so close. I keep saying to myself, only a quarter of a mile, quarter of a mile. Then another turn with people yelling “You’re almost there!” I chant to myself, I’m almost there. Last left turn ahead I hear the most beautiful words…”Just this left turn and you’re done!” I start saying left turn, left turn, that’s it…that’s all you have to do. I get to this left turn and see a HUGE crowd of people standing and cheering. It’s absolutely overwhelming. The cheers are streaming in, you hear your name called by a few familiar faces. I couldn’t tell you who they are right now because I had tears in my eyes. I had to fight back the emotion as I was about to completely break down. I look down, gather my composure, look back up to see the FINISH and a few strays in front of me who had passed me at the last minute. I take off in a sprint, despite the excruciating pain, pass 3 of the 4 and straight into the arms of Jay. Oh, I love this man, yet have never before been so happy to see him. It meant I had done it. I had run 13.1 miles (well about 11.5 of them.) I finished this monumental task and started crying. More hugs from Jessica and Joan then I get out of the way to wait for Re. I see her…she comes in strong. First thing out of her mouth….Jay said drink Pineapple Juice. Ha Ha…ok, let’s find the pineapple juice. On the way home it occurred to me that I had just finished all that running, had burned all those calories and was hungry. I’m having a BURGER, I exclaim. And so I did. It was the best burger I’ve had in a very long time. Still proclaiming I’m never doing this again all the way home. The next day I review the results. I see my time. 2:46. I know I can do better than this. After all the full marathon winner beat me by more than 20 minutes. What? I can’t possibly go down like that! This can’t be the best I can do. 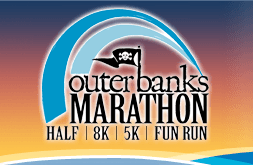 Ok, when does training start for the Flying Pirate half in April? Yes…I’m hooked. I suppose there are worse things to be hooked to than running. I’ll take it! In April I will finish in 2 hours.